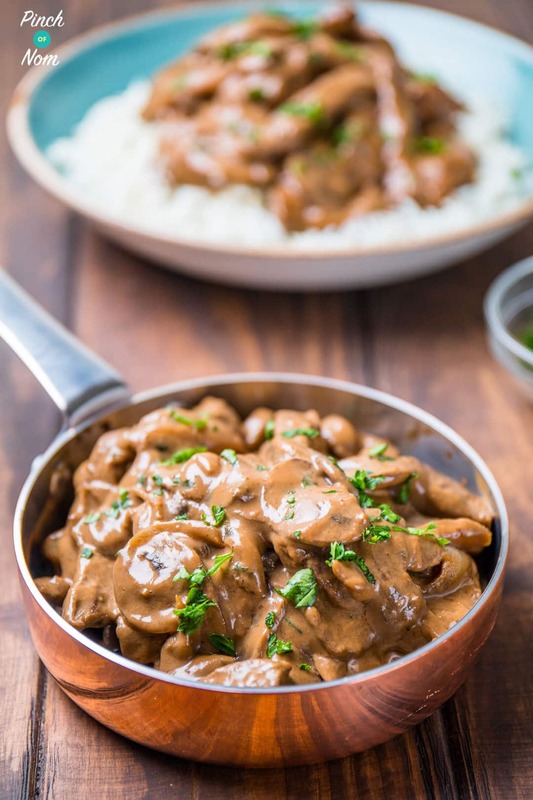 This Beef Stroganoff, is so creamy and indulgent, you’ll never believe that it’s Slimming World, Weight Watchers and Calorie Counting friendly!! This Beef Stroganoff is also very, very tasty. If we could have this every night for a year we most certainly would! Mushroom Stroganoff (recipe coming very soon!) was a permanent feature on our restaurants menu, and we’d make it with mustard, double cream, and stock. This Beef Stroganoff isn’t made the same way, but tastes pretty damn good! Some people like to put Paprika or even tomatoes in their Stroganoff, but we’re not one of those people! That’s not to say you can’t put it in, it’s just not something we’d do. 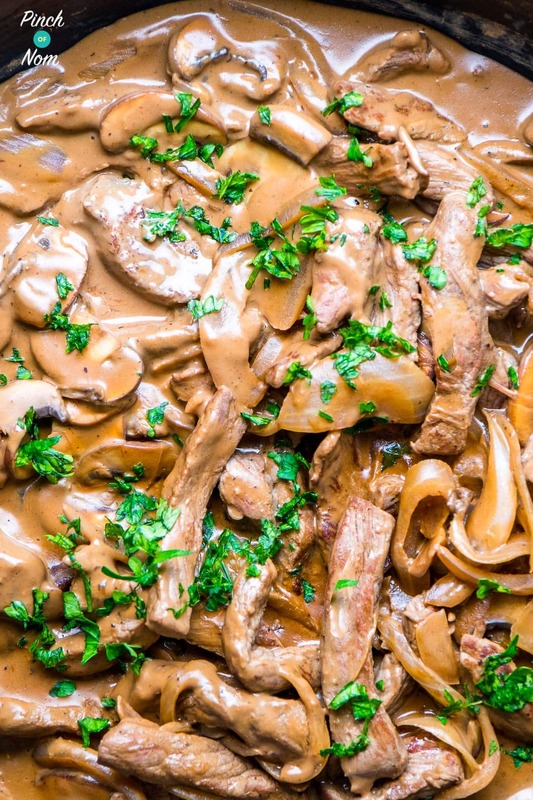 The same goes for what you serve this Beef Stroganoff over. We prefer boiled rice, but you could use pasta too, or chips – lots of chips. Oh yes! 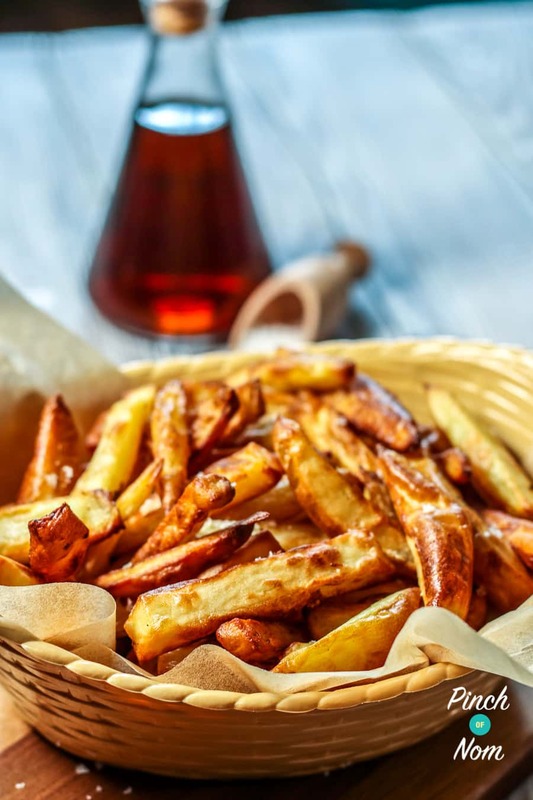 If you love chips, then you should try our Syn Free Slimming World Chips! Aren’t these little dinky pans cute?! Our new favourite thing, so expect lots and lots of recipes in them! 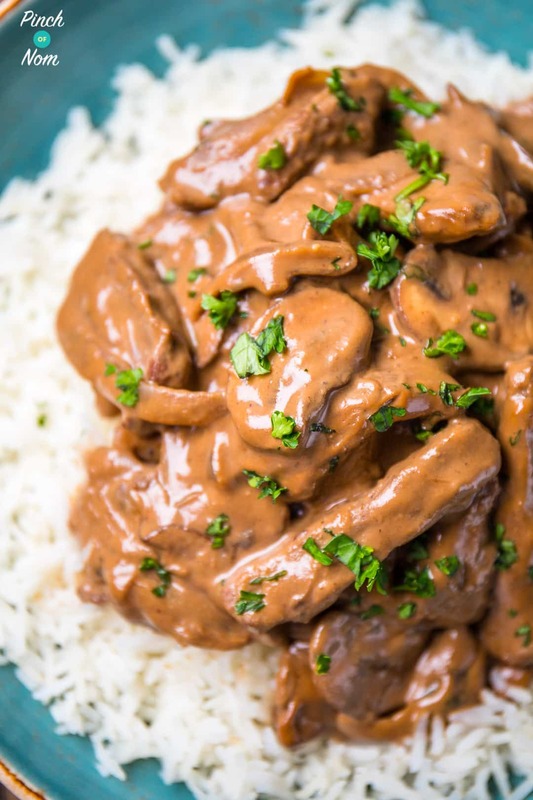 Some of you love this Beef Stroganoff recipe! 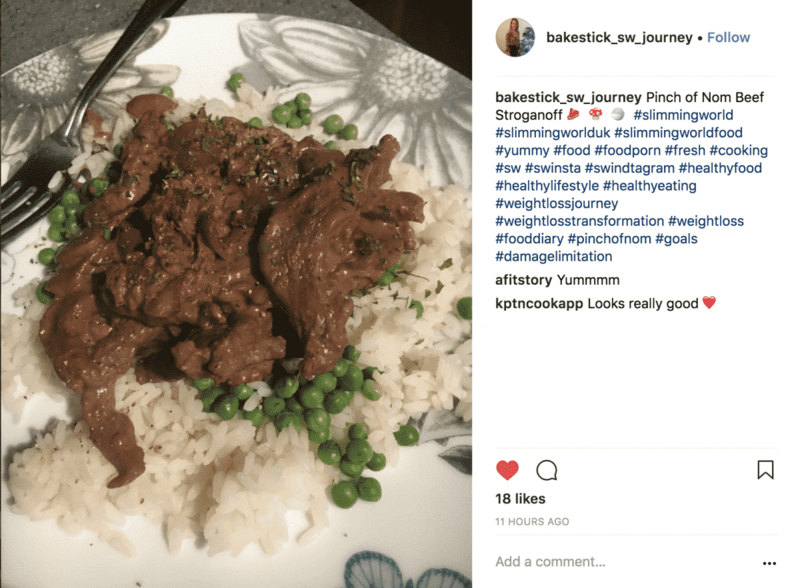 One of our Instagram followers @bakestick_sw_journey made this dish and loved it! One more of our Instagram followers @mumof2_healthyjourney made this dish and loved it! One of our Instagram followers @thelifeoflisa_mc made this dish and loved it! 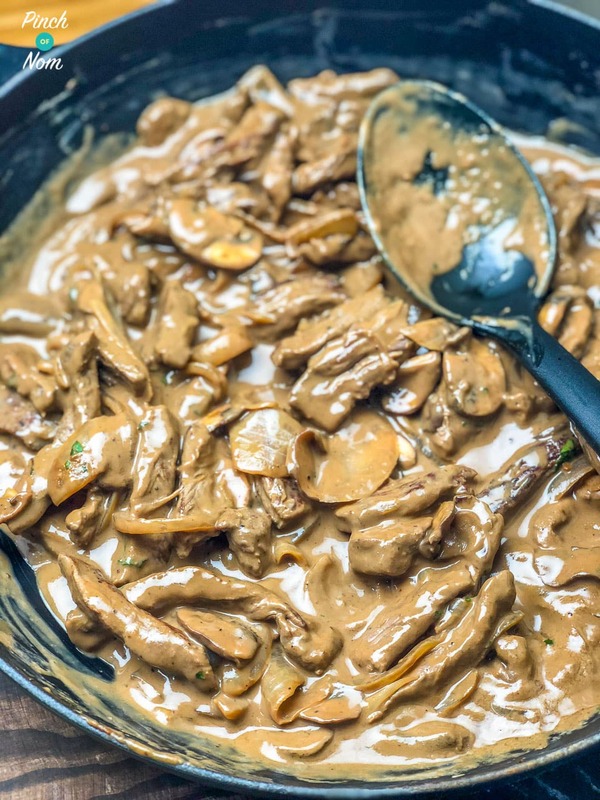 Want to see how easy it is to make this Beef Stroganoff? Watch the video!! 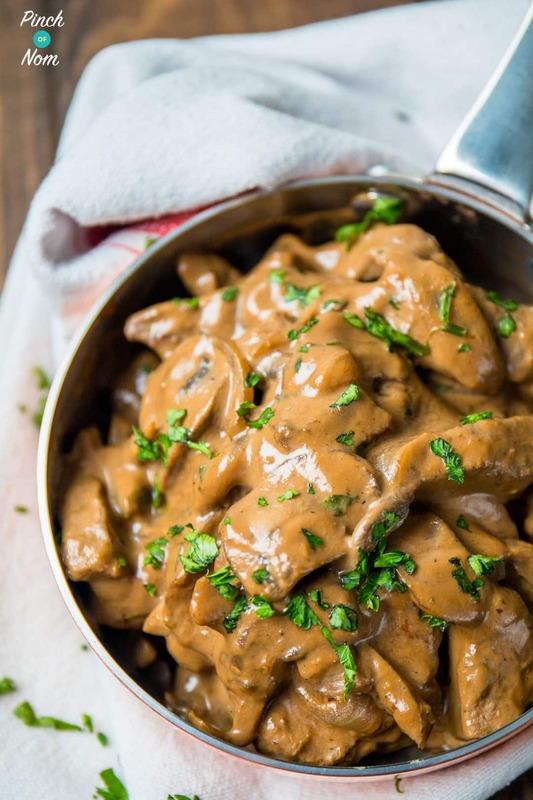 What do I need to make this Beef Stroganoff? This recipe uses the usual kitchen basics. One that isn’t essential, but will make your life SO much easier is a decent knife. Being chefs we’re a bit obsessed with our knives, but if you can, you should have one good knife. Doing Slimming World, Weight Watchers or Calorie Counting, you’re probably going to chop and prepare a LOT of vegetables. 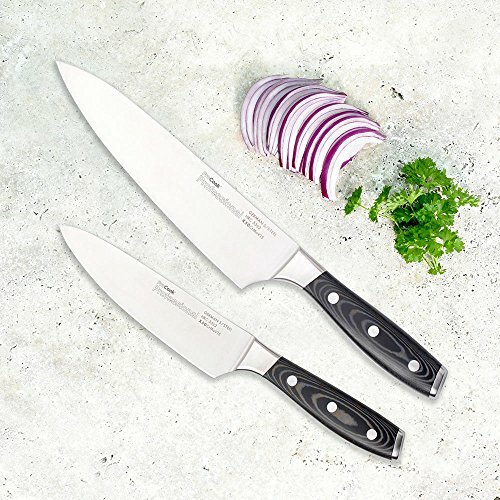 A good knife will make your life so much easier! 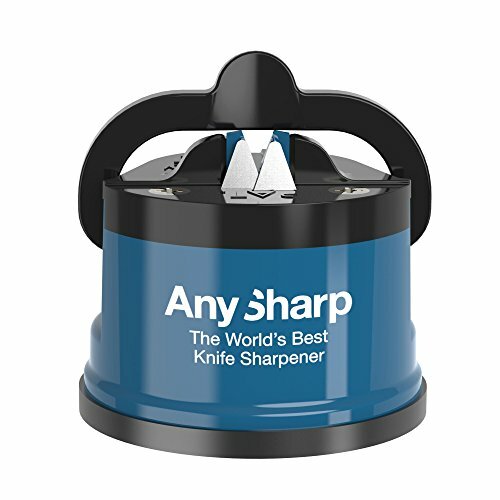 If you’ve already got a decent knife then one of these knife sharpeners may be useful. 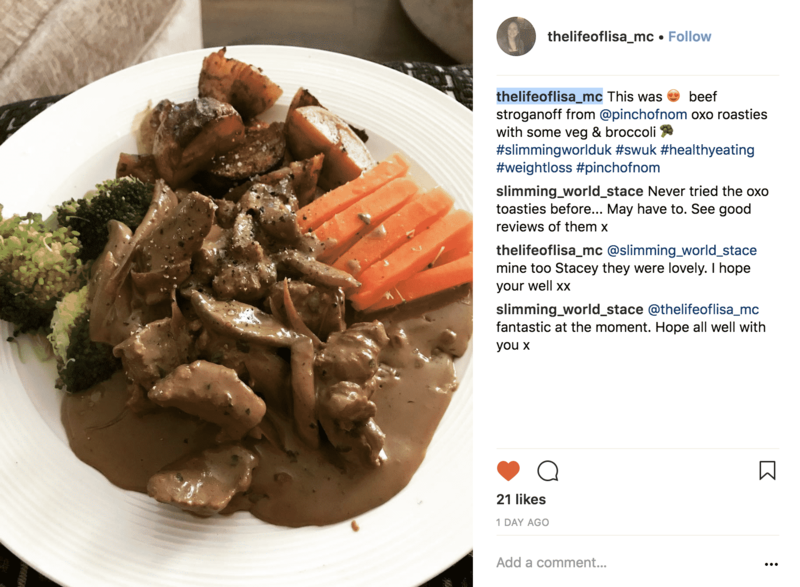 How many Syns are in this Beef Stroganoff? 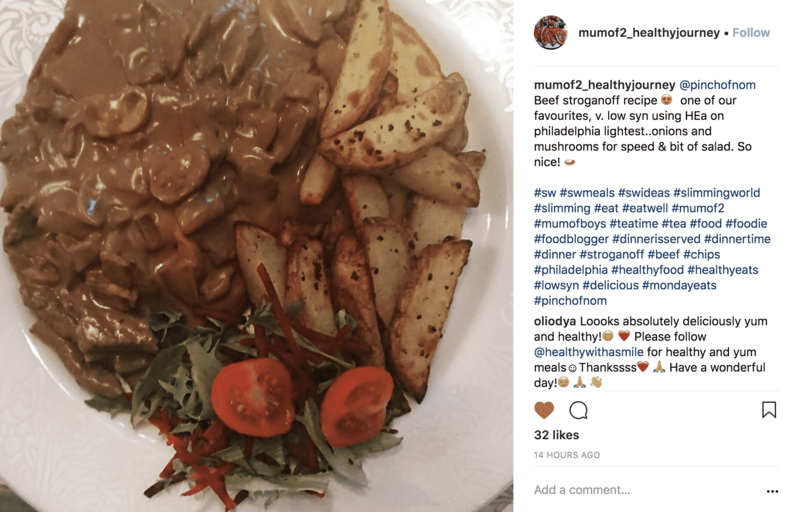 We’ve used Philadelphia Lightest in this Beef Stroganoff to keep the Syns as low as possible, you could use a different soft cheese, but just remember to add the Syns accordingly. Philadelphia Lightest is no longer a Healthy Extra A, and we don’t think this recipe would work with any other current HEA, therefore the Syns have been adjust to reflect the change. You can serve this Beef Stroganoff with loads of different speed foods. 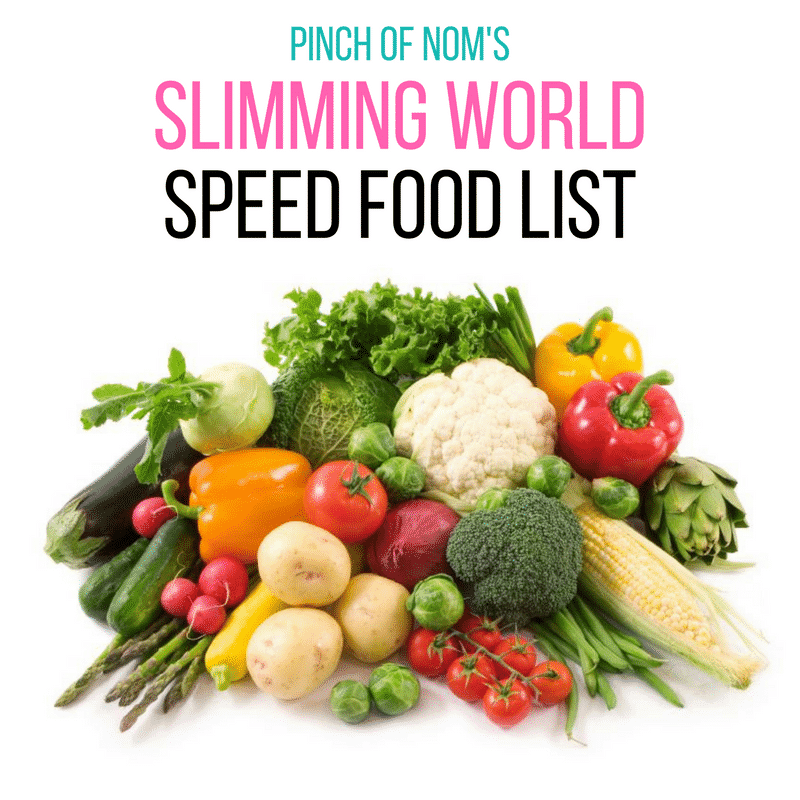 Why not try something from our Slimming World Speed Food List. 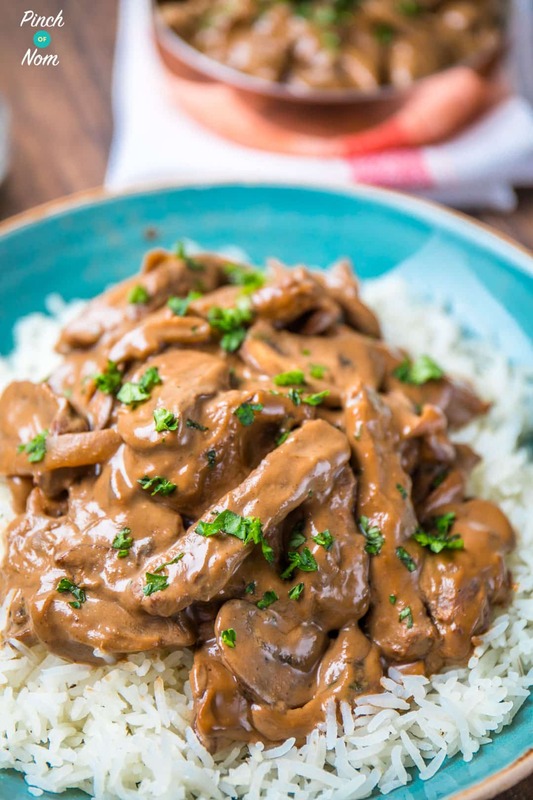 How Weight Watchers friendly is this Beef Stroganoff recipe? This incredibly tasty recipe makes the most indulgent meal, but really won’t break the Points bank! At just 7 Points per portion, you’ll have plenty of Points left to use for other foods! Just make sure you allow points for whatever you decide to serve this with. How many Calories are in this Beef Stroganoff? You’d be forgiven for thinking this recipe was packed full of calories as it’s it really rich and full of flavour. 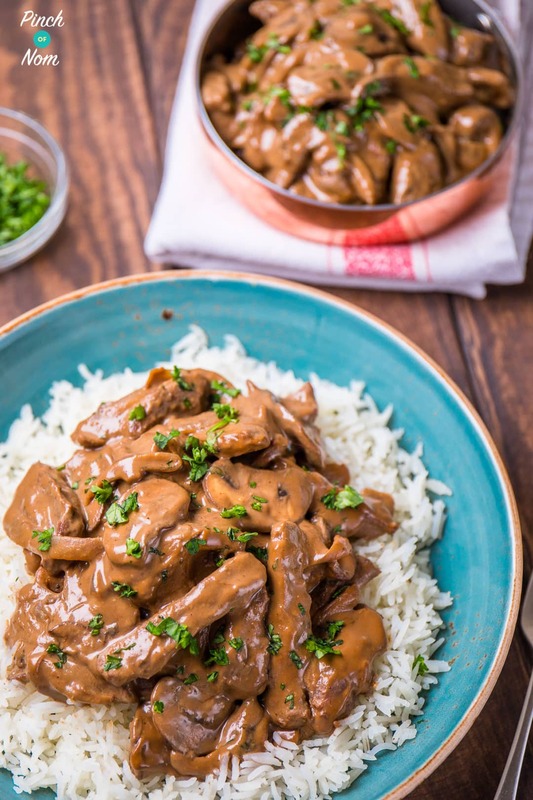 In actual fact, this Beed Stroganoff has less than 300 Calories per portion! 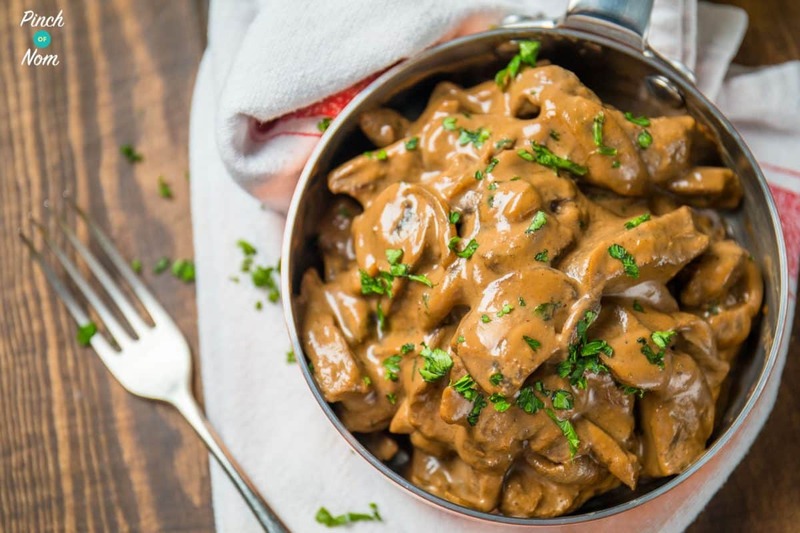 How do I make this Beef Stroganoff? Season the beef with a little sea salt and freshly ground black pepper, then set aside. 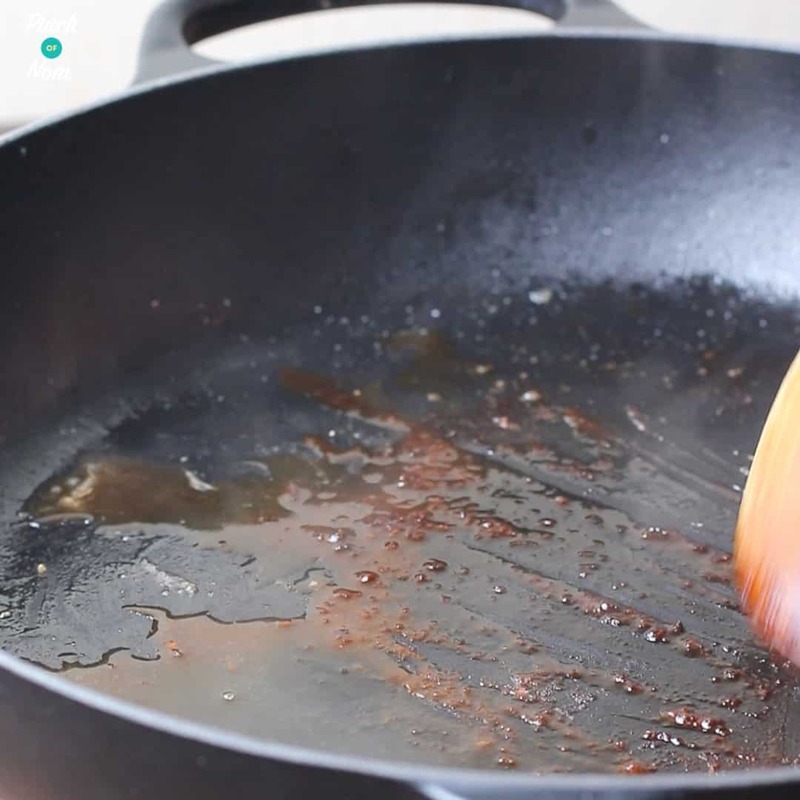 Spray a large frying pan with Low Calorie Cooking Spray and place on a medium heat. Add the beef to the pan and quickly seal on all sides. 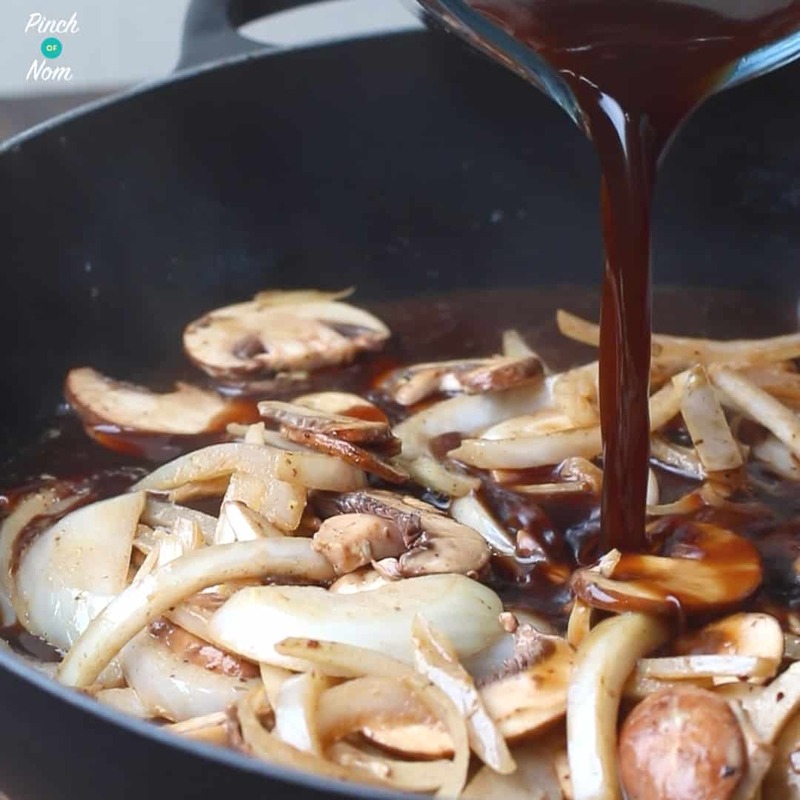 Remove the meat from the pan, add the White Wine Vinegar and Worcestershire sauce to deglaze. Scrape and stir the browned bits from the pan over a medium heat. When most of the liquid has evaporated spray the pan with some Low Calorie Cooking Spray. 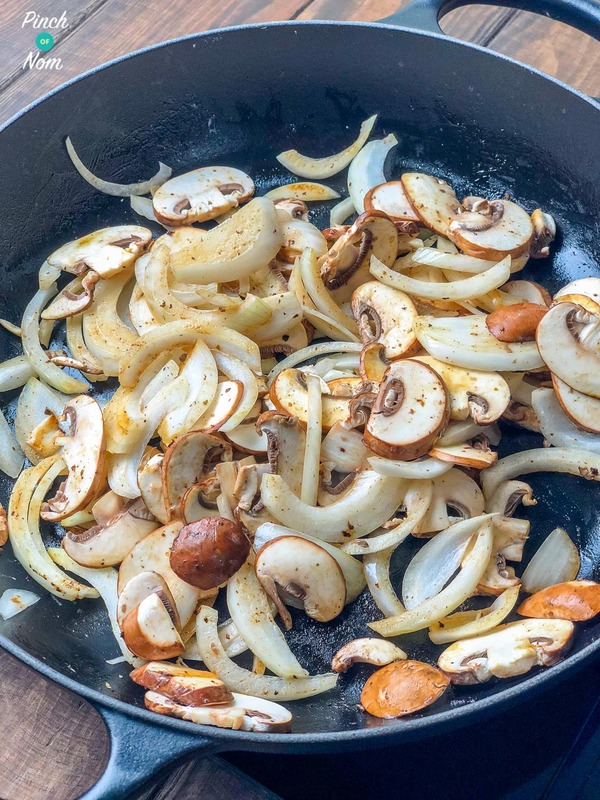 Sauté the onions and mushrooms until they start to brown. Add the Dijon mustard and the Brandy and cook for a minute or two. Add the stock to the pan and reduce the liquid by half. Stir in the Philadelphia over a low heat, making sure there are no lumps of cheese remaining. 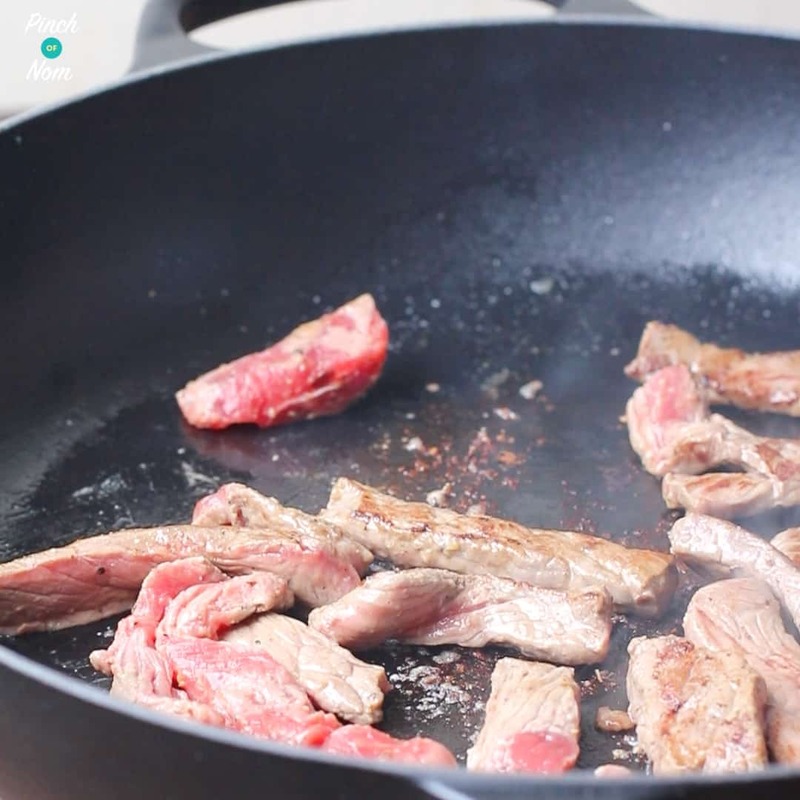 Add the beef back into the pan, stir well and simmer for 5 – 10 minutes depending on how you prefer your beef. We like ours pink so it takes about 5 minutes. If the sauce looks a little thick you can add some more water until it reaches the consistency you prefer. Sprinkle with some chopped parsley and serve. Can I freeze this Beef Stroganoff? Like this Beef Stroganoff? You’ll love our other Slimming World recipes! Just a quick note step7 in both the pictorial step by step guide and the written method says to add the mustard along with Worcestershire sauce – the video adds the Brandy at this point. Love your recipes and your site. Many many thanks. How lovely, thank you. So glad you enjoyed it! Could this be done in the slow cooker? This recipe won’t really work in the slow cooker. There are a number of steps that need to be done on the hob in the preparation process, and one they’re done the dish is just about ready! Is this the right white wine vinegar plz?? Japanese rice wine vinegar?? or the blue dragon white rice vinegar?? It’s become a firm favourite for us too. So glad you enjoyed it! Hi, do you need to use brandy? Could you substitute the Philadelphia for Quark to make Syn Free if not using HEA? Will definitely be making it again!! Am I able to do this in a pressure cooker please? thanks. This will be the 5th time we’ve had this recipe. Amazing!! Just keep simmering until you reach the desired consistency. Timings depend on the pan. It’s easier if you use a wide, shallow pan as it will reduce far more quickly. We use a 30cm pan. Just made this for the whole family. It was delicious! Thanks so much. One problem tho-I just could not face any veg. Will I have harmed my diet not having speed with this?! Can you do this without the mustard and brandy? I don’t have a beef stock pot to hand. Can you double the beef stock cubes or use a chicken stock pot instead? Could you replace philly with quark? The philly is best as it adds to the creamy texture and flavour. If you do choose to use quark, please add carefully, off the heat. It’s not as stable as philly when added to hot dishes and may split. I hate cheese, is there an alternative that I can use instead of Philadelphia? The only other option would be to use Quark, but this can have a tendency to split when heated. Hope that helps! 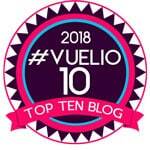 My daughter has just made me aware of this site – what an absolute bonus! Just what I need – I’ll be making the beef stroganoff tonight! I’ve added all the ingredients to slow cooker after step 8 and will add philly before sreving will this work? A key part of this recipe is simmering on the hob until you reach the desired consistency for the sauce. I’m not sure you can achieve the same result in the slow cooker. I am allergic to cheese is there an alternative I could use? I’m not sure what to suggest instead of Philadelphia, as it’s a major component of this recipe. Sorry! Cooked this tonight. Was amazing. I did it with left over roast beef. Worked a great. I also used laughing cow low fat as my local didn’t sell light Philadelphia. Good alternative. So glad you enjoyed it, Gemma! Hello, could I use mustard powder instead of Dijon mustard? Looking forward to trying this recipe tonight! Thank you for you all hard work, please can I use pork instead of beef. HI!! Fabulous recipe! I’ve read a few comments about the Philadelphia…..Just wondering for people with “cheese aversion”… could you use plain non-fat yoghurt as a substitute??? You could try adding yogurt at the end instead of Philadelphia. Please be careful to add the yogurt off the heat so that it doesn’t split. It’s important to choose a good quality, lean frying steak and seal it quickly so that it stays tender. 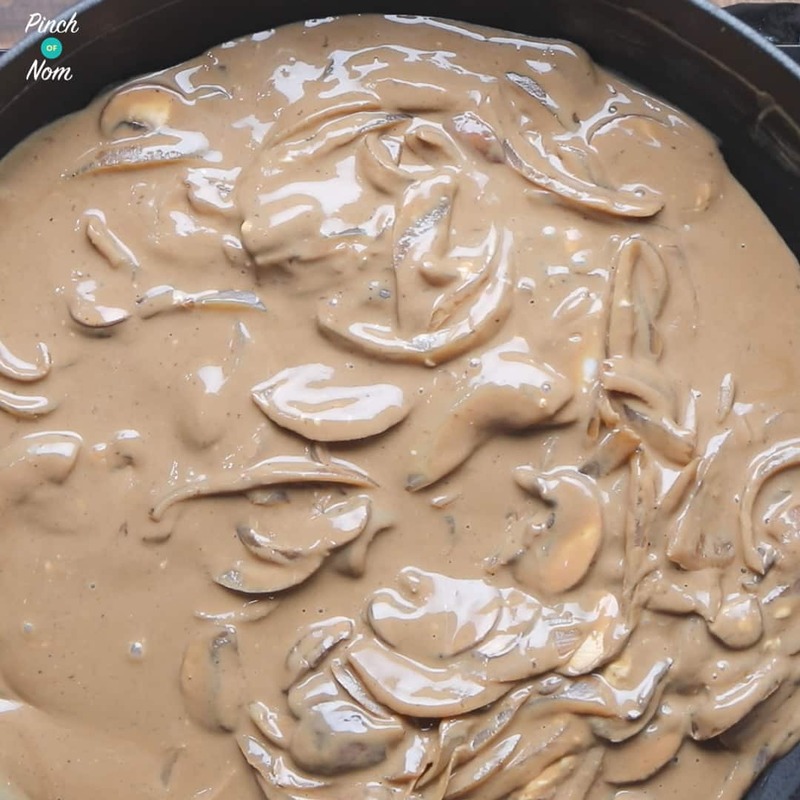 Great idea to switch to a mushroom stroganoff this time – one of my favourites! This is delicious! 😋 I used mustard powder and didn’t add Brandy. Had it with cauliflower rice tonight but I’m making actifry roast potatoes next time. Mmmmm!!! So glad you enjoyed it, Jo! Oh my goodness me! So tasty! 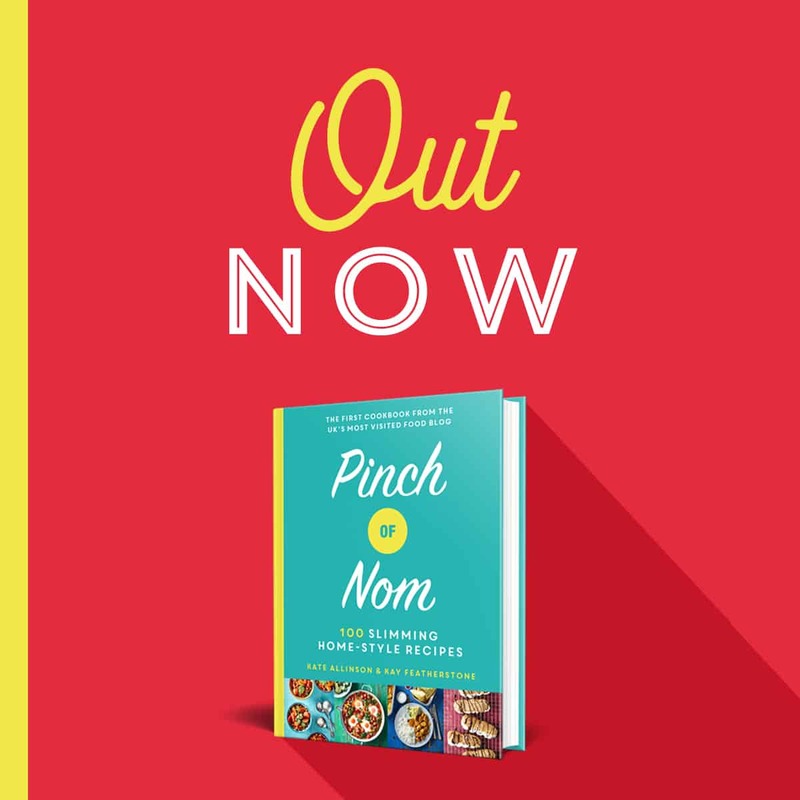 I swear you’re making me into a cook pinch of nom! My favourite recipe so far. 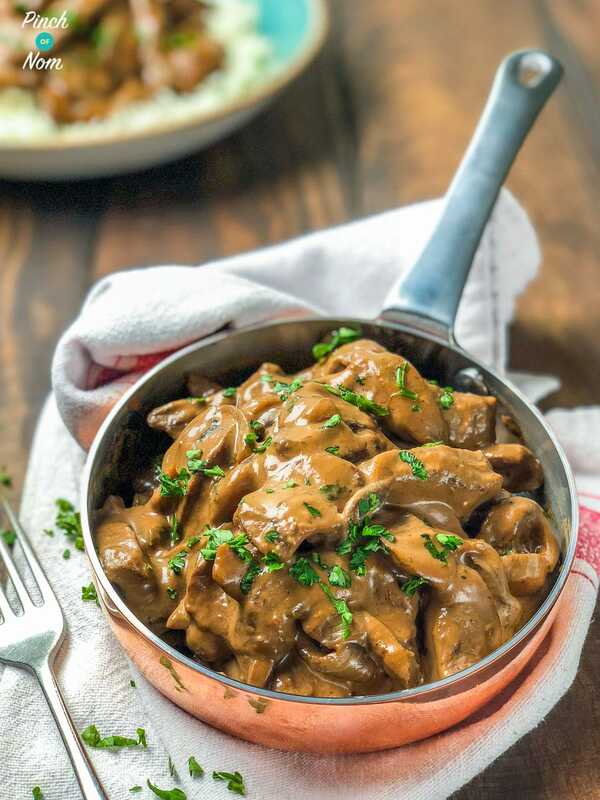 I normally hate stroganoff but it’s my hubbys favourite so going to make this for his Valentine dinner as it looks delicious. How many syns in 220g Philly? I’m not very good at working syns out. The recipe uses 2 HEA quantities of Philly lightest, but it makes 4 portions. It explains in the recipe that this means you’ll be using half your HEA allowance per portion. Quick and easy and very tasty! Another great recipe, thank you. So glad you enjoyed it, Lorna. Thanks for getting in touch! My sauce seems to watery/thin. Any ideas on how to thicken it up please? You mentioned this meal would be 11 Syns if you didn’t want to use it as your Heathly Extra – is that for the entire dish or per portion? Can’t wait to try this dish! I haven’t made this yet, it’s on the menu for next week and looks yummy. I just wanted to say how fantastic those little knife sharpeners are! Best one I’ve used yet. Hi Sarah – We agree!! It should keep for up to 48hrs in the fridge in a sealed container. Just gotta say that this is an amazing dinner….so good in fact that I’m making it again today so I don’t run out of it in the freezer. Keep up all your hard work on getting the best and tastiest recipes out to us ladies you are stars, thank you. What cut of meat is best to use? I used a touch of red wine instead of the brandy was delicious! A bit confused😕 it says 375ml beef stock made up with 500ml of water? This isnt the first recipe I have used from your site and I have to say it won’t be the last, the taste was amazing, admittedly I added a little extra Dijon but apart from that 100% to your recipe. 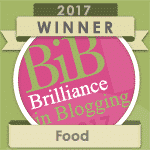 However I just want to add that as an experienced, qualified chef, your recipes shouldn’t work but they work superbly well and I am so glad as they have helped me loose weight whilst still enjoying my food…..thank you! I’ve just started on Slimming World and come across your website. I have downloaded this recipe and will be trying it at the weekend. However I don’t really understand what is meant by “if using half HEA allowance 0.5” I use my HEA allowance as milk so how can I work out the total syns in this? Thank you. beef Stroganoff looks delicious but I tried to print of recipes but it won’t work . Hubbie just eaten left overs from yesterday and requested this dish again ! Thanks for getting in touch, Rhona! Made this for the first time tonight, and while it tasted very nice, my end sauce was alot lighter than the pictures on here….and seemed a little thin….where did I go wrong? All the weights/measurements were correct. Did I not let the stock reduce down enough? Or was it because I didn’t add mushrooms? My girlfriend doesn’t like them, so had leave them out. Hello! Look forward to trying this recipe next week. My boyfriend is veggie however, we both love mushrooms. I was wondering many more additional grams you would add of mushrooms in substitute for the beef? Thanks. 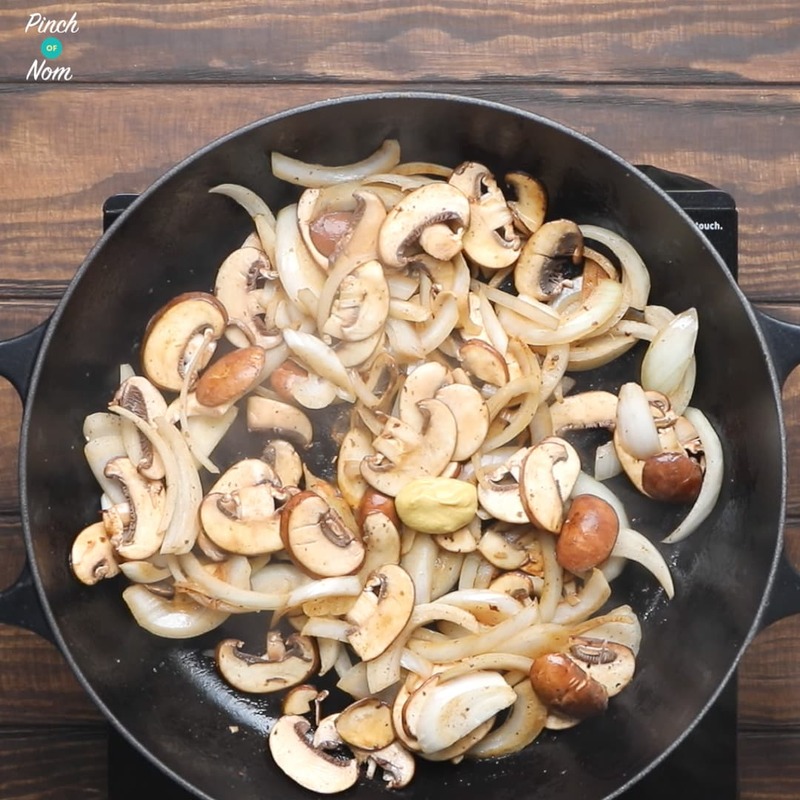 Mushrooms have a high water content and shrink during cooking as the water is released, so you’ll probably need to add a lot more mushrooms to compensate. Hope that makes sense! I would like to make this for a dinner party, can I pre make and heat up whilst waiting for the rice to cook? So glad you enjoyed it, Kel! I’ve only got lean diced casserole beef will this be ok or will be it too chewy for this dish? Has anyone used fat free fromage frais instead of Philly? I dont like syns in meals so looking for an alternative! When the recipe was created, you could use Philly as an HEA choice. Unfortunately, it is no longer a Healthy Extra A, and we don’t think this recipe would work with any other current HEA, therefore the Syns have been adjust to reflect the change. You could try FF fromage frais, but it may split if heated too fiercely. Hope that helps.